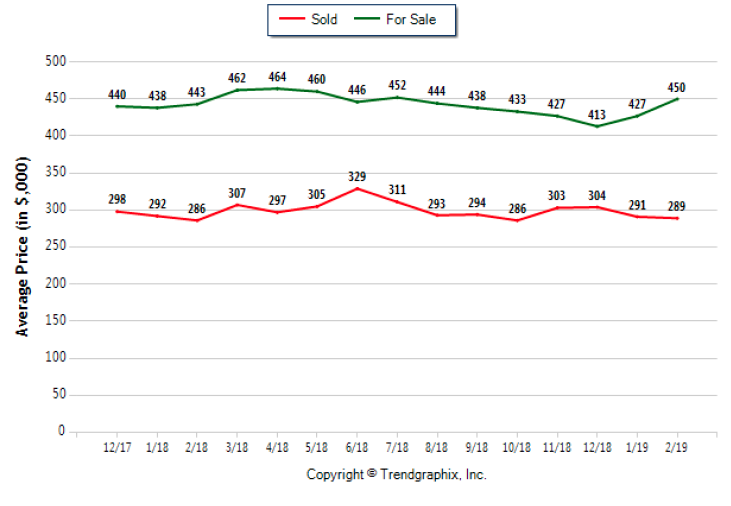 In February 2019, 17.3% more homes were for sale in Hillsborough County than in February 2018 and 1.6% more than in January of 2019. The number of homes sold climbed 9.8% year over year and 29.7% month over month. 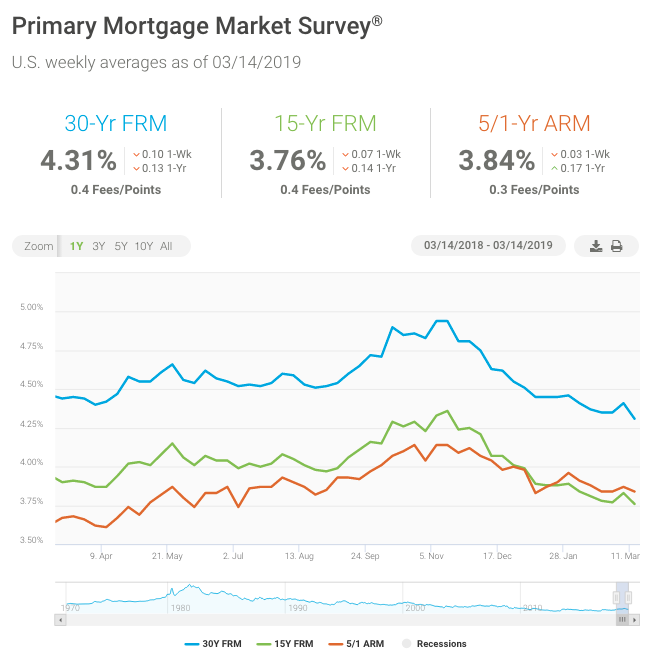 The number of homes under contract rose 21.2% compared to January 2019 and 21.1% compared to February 2018. The Months of Inventory came in at 3.2 months, up 6.7% from the previous February. The Average Sold Price per Square Footage fell 2.1% compared to January 2019, but ticked up 0.7% compared to last February. The Median Sold Price increased 1.3% from last month, while the Average Sold Price decreased by 0.7%. The Average Days on Market trended upward, rising 15.8% compared to February 2018. The ratio of Sold Price vs. Original List Price was 95%, a decline of 1% compared to the previous year. 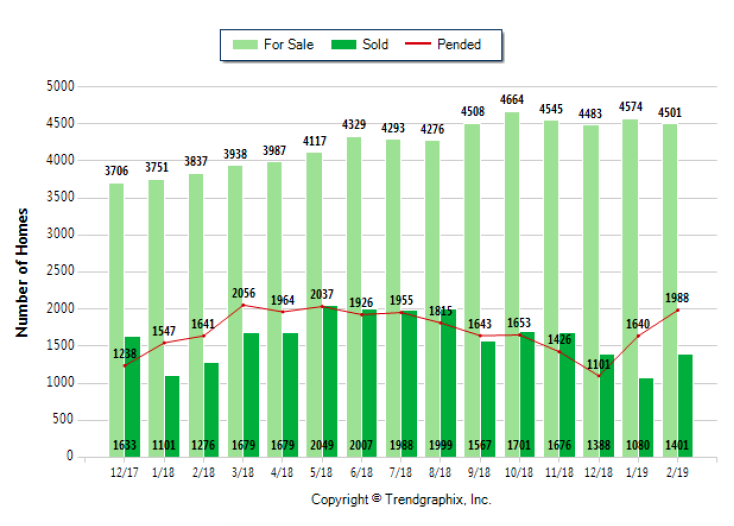 In February 2019, 1401 single-family homes sold in Hillsborough County. 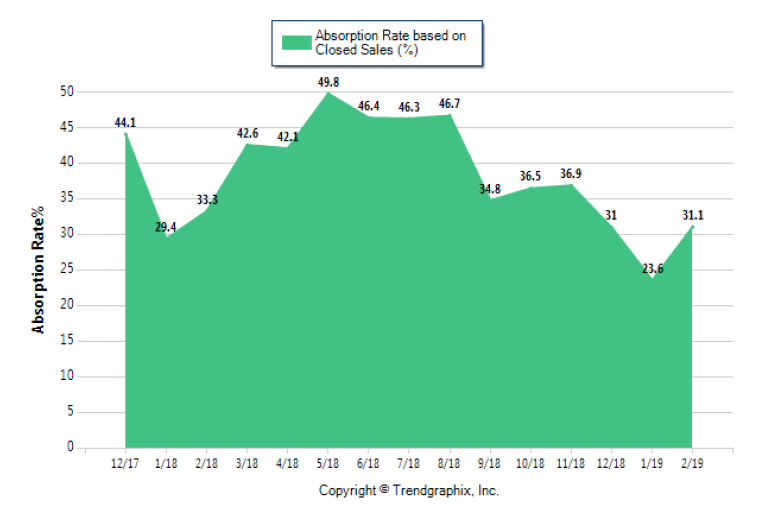 That was an increase of 9.8% from the 1276 sold in February of 2018. It was 29.7% higher than the 1080 sales in January 2018. 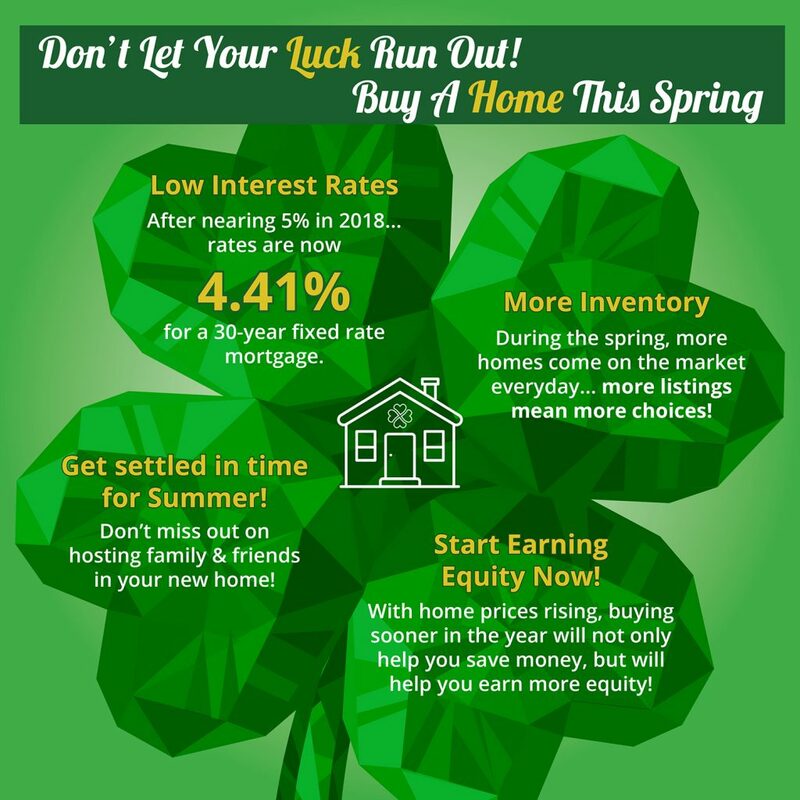 In February 2019, 664 homes were listed for sale, 17.3% more than in February of last year. Housing inventory was down 1.6% compared last month. In February 2019, 1988 homes were under contract. That was 21.2% more than the 1640 last month and 21.1% higher than at this time last year. The Average Sold Price per Square Foot shows which way home prices are headed. Median Sold Price and Average Sold Price can sometimes be skewed by outliers that sell for a really high or low price. So the Average Sold Price per Square Footage is a more normalized indicator of home values. 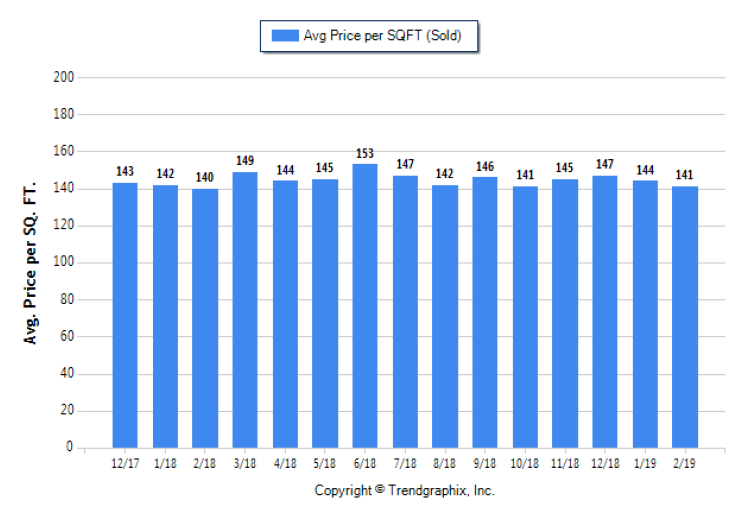 The February 2019 Average Sold Price per Square Footage of $141 dropped 2.1% from $144 last month, but rose 0.7% from $140 in February 2018. The Average Days on Market (DOM) shows how many days the average home is on the market before it sells. An upward trend in DOM indicates a move towards more of a Buyer’s market, a downward trend indicates a move towards more of a Seller’s market. The DOM for February 2019 was 66 days, up 11.9% from 59 days last month and 15.8% from 57 days in February 2018. The Sold Price vs. Original List Price reveals the average amount that sellers are agreeing to decrease their original list price. The lower the ratio is below 100%, the more of a Buyer’s market exists, a ratio at or above 100% indicates more of a Seller’s market. In February, the Sold Price vs. 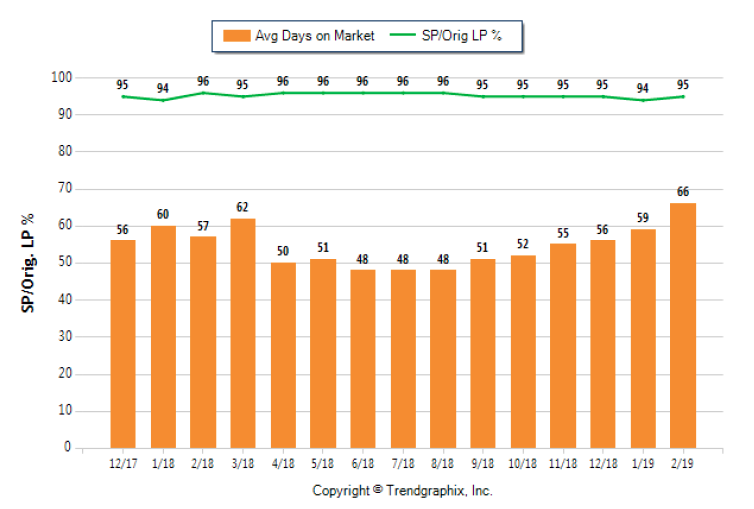 Original List Price of 95% was 1.1% more than in January 2019, but 1% less than in February 2018. The Average For Sale Price in February was $450,000, up 1.6% from $443,000 in February of 2018 and 5.4% from $427,000 last month. The Average Sold Price in February was $289,000, up 1% from $286,000 in February of 2018 and 0.7% from $291,000 last month. The Median Sold Price in February was $241,000, up 0.8% from $239,000 in February of 2018 and 1.3% from $238,000 last month. 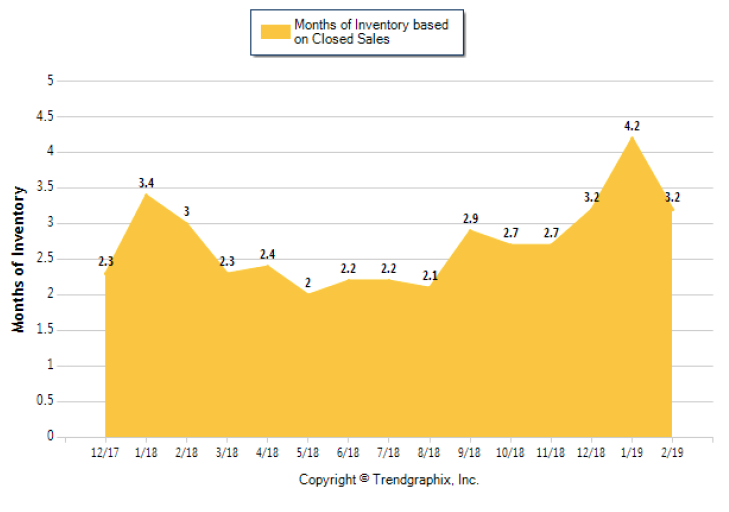 The February 2019 Months of Inventory of 3.2 months was 6.7% higher compared to last February but 23.6% lower than January 2018. Absorption Rate measures what percentage of the current active listings are being absorbed each month. The February 2019 Absorption Rate fell 6.6% to 31.1 compared to February 2018 but jumped 31.8% compared to January 2019. HILLSBOROUGH COUNTY, Fla. — Spring Break is almost here for Hillsborough County kids. Students will be off school March 18 to 22. If you are looking for something fun for your kids to do during the break, county officials have the following five suggestions for you. Children in grades K-8 can spend time with their friends in a supervised environment. Park and Recreation staff create an atmosphere where kids can play and explore. The cost for the camp is $38 for the week. There is no cost for kids enrolled in the After School or Camp Sparks programs. For more information, click here or call (813) 744-5595. The Hillsborough County Public Library Cooperative offers kids a free way to explore ten local museums and attractions including Big Cat Rescue, the Henry B. Plant Museum, the Glazer Children’s Museum and the Tampa Museum of Art. You can get a Discovery Pass by clicking here. The annual Great American Campout allows families to explore and learn about the outdoors in safe environment. It is being held at Alderman’s Ford Park on March 16 and 17. Kids can fish, hike, play volleyball, paddle on the lake, use a pie iron to make dessert and learn how to start a campfire. Registration is required. 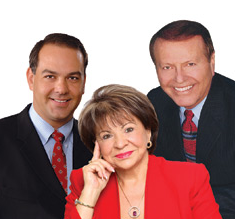 For more information, click here or call (813) 957-6150. Hillsborough County is hiring teenagers for part-time and seasonal jobs. Available positions include lifeguard, recreation leader, and youth intern in various departments. Pay starts at $10.50 per hour. To learn more or to apply, click here. Hillsborough County is always looking for teenagers who want to make a difference in their neighborhood. Teens can assist pets at the county shelter, deliver meals to seniors, clean up the environment, or help veterans, the homeless or other children. To apply to volunteer, click here.